This piece is one of two I created for the themed show “The Lollipop Guild” at Lovetts Gallery in Tulsa, Oklahoma. 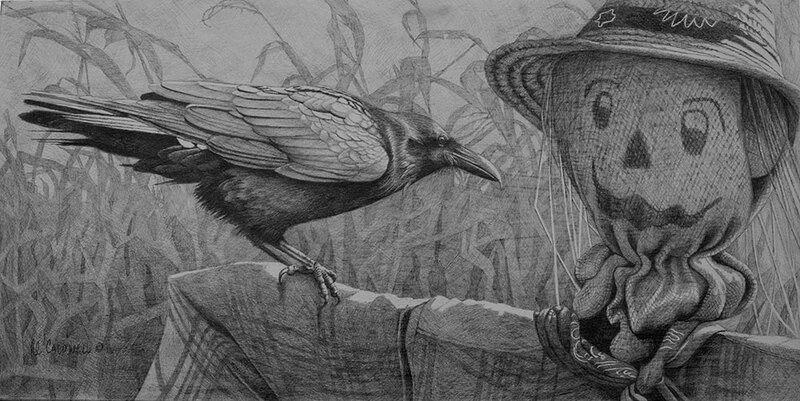 Inspired by the classic movie “The Wizard of Oz,” I wanted to create a piece based on the Scarecrow character and would have never guessed how difficult it would be to find a scarecrow for my reference. I still hadn’t found my needed scarecrow as I headed out to Tulsa for my exhibit at the gallery in November 2014. On my two-day drive out, I was on the constant lookout, head turning, camera always ready and still nothing. As I drove up to the gallery on the day before the show, I was amazed to find two scarecrows greeting me at the entrance of The Farm Shopping Center where the gallery is located. How perfect: The scarecrow reference I needed for Lovetts’ “Lollipop Guild” show was found at Lovetts. This particular piece was originally planned to be a painting but, as with the original film, I thought it better as a black and white.